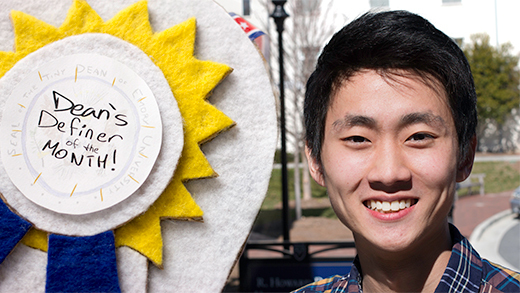 Emory senior Daniel Lim has been honored by Campus Life for his commitment to social justice and cultural humility, two key concepts that nurture the university's inclusive community. Photo by Matt Cone. One day, during his senior year in high school, Daniel M. Lim was conducting an experiment in his seventh-period physics lab when his cellphone rang. It was an unexpected call from an unfamiliar area code — a call that would profoundly change his life. "I wondered who could be calling me from the 404 area code," says Lim, who grew up in Bellevue, Washington, outside of Seattle. "I did not immediately associate it with metro Atlanta." Fortunately for Lim and Emory, he took the call. It was the university's Office of Undergraduate Admission. His first choice of colleges was inviting him to enroll. Although he had never visited the Emory campus or even the Atlanta area, he was confident that this university could offer him a "structured way to experience something new," including an even wider range of diversity than he found in Seattle. Lim accepted Emory's offer and opened the door to a learning environment that has afforded him countless opportunities to "experience something new" in ways that have profoundly changed his life. Equally important, Lim's decision has enabled him to positively impact the lives of an untold number of Emory students, staff and faculty through his commitment to nurturing the university's inclusive community. Lim's Emory experience, like that of so many other students, embodies a special commitment to two key concepts of the Division of Campus Life's vision and mission: social justice and cultural humility. As an exemplar of both, Lim, now a senior in pre-med, received the "Dean's Definer Award" in late February. The award honors individual students whose character and commitments reflect those of countless Emory students. While Lim's Emory education is broadening his horizons dramatically, Lim says his commitment to social justice and cultural humility began with his childhood, much of which was spent with his parents and his sister, his only sibling, in the small church that his father pastored. "I grew up in the church. With no other children around, my sister and I were always a part of the congregation and involved in all aspects of the church," Lim recalls. "During the years that I was a pastor's kid, I learned a lot about the importance of an inclusive community and extending compassion and support to people of all backgrounds." Since arriving on the Emory campus in fall 2011, Lim has been busy earning honors in his academic studies while finding time to engage with a diverse range of activities beyond the classroom. During his summers in Seattle, he worked as an intern with a nonprofit executive search firm, a marketing intern with an AIDS alliance, and a research assistant with a cancer research center. Back in Atlanta, he served as a lab assistant at Emory's School of Medicine and as a program assistant at Goizueta Business School. But the most formative of his Emory experiences, Lim points out, are those campus engagements closely related to personal commitments that align with social justice and cultural humility. Those activities have also enabled him to make significant contributions to the university community. Lim first served with the College Council as a freshman legislator in 2011-12. During his sophomore year, he held the post of vice president for programming. Working with a diverse group of student organizations with common goals, he led a team of 30 students in a successful effort to expand the annual one-day State of Race event into a full week of programming. Launched in March 2013, Social Justice Week activities range from academic lectures to volunteer opportunities to entertainment. "Our goal is to raise awareness of social justice issues like diversity, sexual assault, and bullying on Emory's campus," says Lim, who serves now as chief of staff for the College Council. "We want to equip people with the knowledge and confidence to address social issues that are normally not discussed often enough or openly enough." For the past two years, Lim has served also as host for the 1836 Dinners, named for the year Emory was founded. The program includes a dinner for each freshman residence hall in the fall, as well as smaller theme dinners each month throughout the year. The guests share a meal and an evening of thoughtful conversation with the dinner hosts, student leaders, faculty, staff, alumni, administrators and a distinguished guest speaker. As a patient care volunteer with Children's Healthcare of Atlanta, Lim assisted nurses and interacted with patients and families throughout the organization's various divisions. Currently, as a research intern with the organization, he is participating in studies for children with chronic kidney disease and completing a directed study in Emory's Department of Anthropology. Extending his commitment to the international level, Lim served as campaign coordinator and communications director for GlobalMed at Emory, helping to raise $4,000 and partnering with migrant assistance program in Thailand to assist Burmese refugees. While Lim's commitment to social justice and cultural humility has greatly enriched his Emory experience, he expects it to also enhance his planned career as a physician. "I don't want to treat all of my patients the same or just prescribe medication," Lim says, explaining that he will take into account the role of biosocial factors. "For example, I want to understand how unemployment, poverty, cultural traditions, and other factors may impact my patients and their health care needs." Lim praised student leaders and student organizations that have consistently engaged issues of social justice and cultural humility "I have enormous respect for these leaders and their organizations — and for members of the university community, in general," he says. "They do so much to give back on a daily basis and have been such an inspiration to me throughout my Emory career." What advice does Lim offer other students who want to help make a difference in those areas? "My philosophy is always to learn more, and to be consciously aware of what you do and do not know," he explains. "Before reaching a judgment about someone, talk with that person and learn about their life and background — and make learning about issues and individuals a lifelong practice."